Hong Kong!!! What a big city. We spent a few days here but the city was pretty expensive, and there were so many cars whizzing by in every direction it was a bit dangerous for a frog unless he had a keen eye and crossed carefully. Hong Kong sure was a change after traveling through the poorer countries of Vietnam and Cambodia! 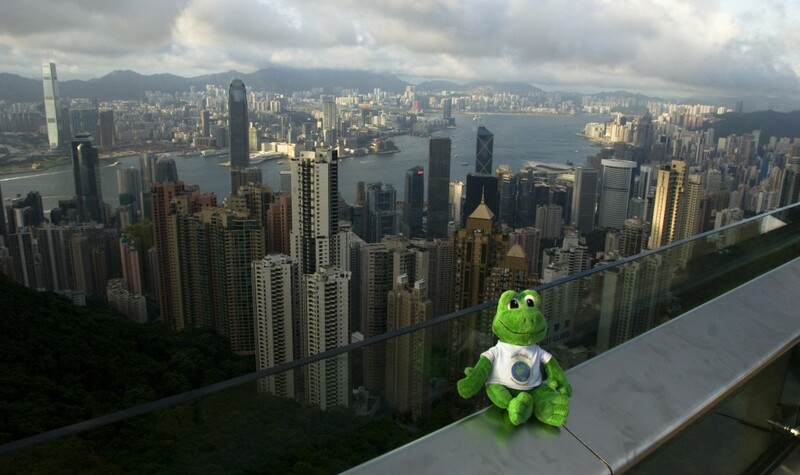 Here is Polly at the top of Victoria Peak. We took a really old-fashioned tram all the way up the hill. It was attached to the ground but went up so steep it felt like we were going to flip over backwards the whole time. In the background you can see the amazing Hong Kong skyline! 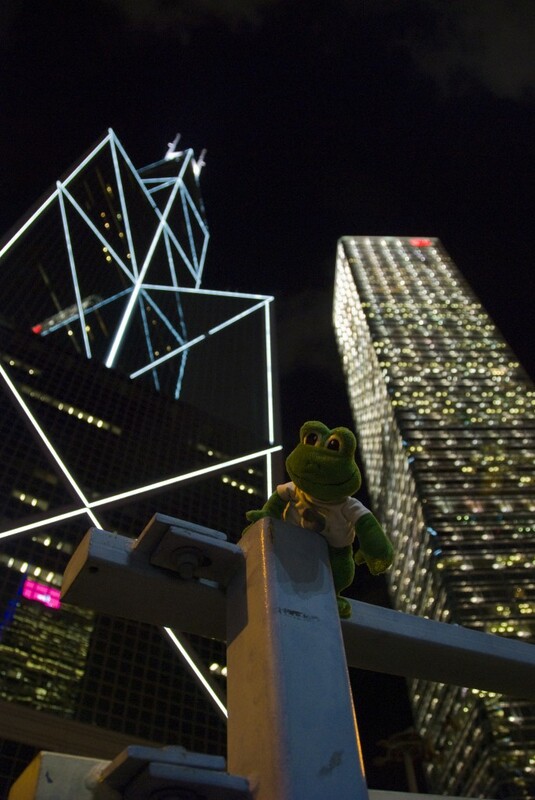 At night all the buildings on the skyline of Hong Kong light up, and every night at 8pm there is a light show. They play music on loudspeakers across the harbour and anyone can come watch the buildings 'dance' away. 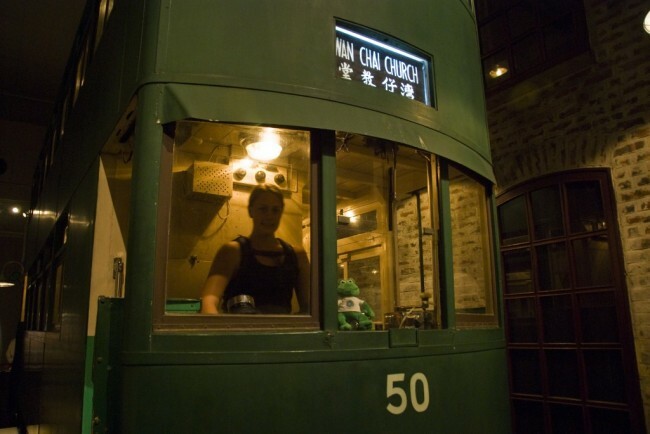 This is in the History Museum in Hong Kong. They had a display of one of the old trolleys that ran through the city a long time ago. Kristy and Polly decided to get on board and pretend to be the drivers! 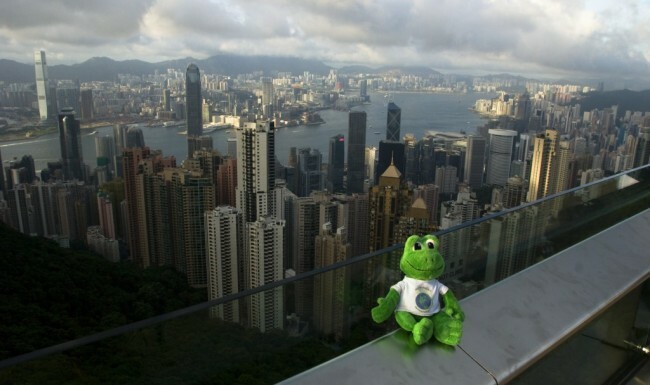 That’s really interesting about Victoria Peak. Hong Kong used to be part of the British Empire, and I guess some of the place names must have stuck. Photography isn’t something that everybody does well, but you get really great pictures that tell a wonderful story. I “jump” to your posts every time I see a new one! 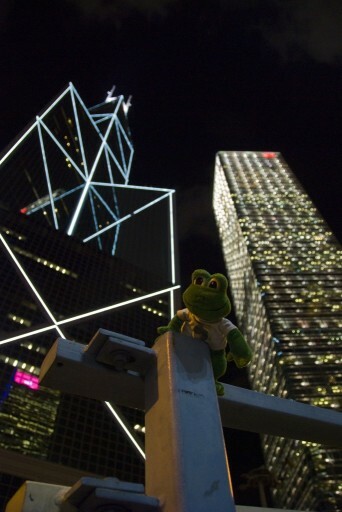 I visited Hong Kong in 1996 and I loved it, but I am sure it’s changed a lot since then. Like you, and every other tourist to Hong Kong, we also took the Peak Tram to the top. The view was magnificent! While in Hong Kong, we were given a walking tour map…and we had so much fun following the map to explore temples, markets, neighborhoods, restaurants, parks, etc… I remember being fascinated by the bird market we found. Hundreds and hundreds of song birds were kept in wicker baskets, which were dangling from tree branches. The noise was tremendous…more tweeting that you can possibly imagine! If my memory serves me right, people bought the birds for good luck. Thanks again for a great post and an equally fantastic memory boost! P.S. Do you have any pictures from the bird market? I’ve really enjoyed reading about your travels through Asia. I stumbled onto this site a few days ago and read all of your posts together, and I hope there are more to come. to Polly 3, we didnt actually find the bird park, although I’m sure it would have been really cool to see. We didn’t spend too long in Hong Kong as it was really expensive there. we did wander around the area we were staying in, just across the harbour from the downtown area. You kind of echo the sentiments of someone like Anthony Bourdain: the “touristy” places are really expensive, but if you get off of the beaten path, the people are more interesting and you can travel abroad at a lower cost. You guys are teaching all of us as much about traveling as you are the places you’ve seen. Good stuff! Hong Kong sounds like Donkey Kong. Al…You’re funny! Thanks for writing! I thought Hong Kong was great. p.s NEXT TIME YOU GO TAKE ME WITH YOU. Did the light show look pretty? I can’t believe that my post is still there! Hong Kong looks like a pretty place!! Polly are you afraid of heights? In the first picture it looks like you where scared.